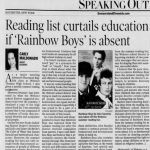 Behind the Rainbow – An investigative look into the Webster, NY challenging of Rainbow Boys, a LGBTQ YA fiction novel by Alex Sanchez. 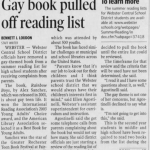 In the summer of 2006, Webster Central School District Assistant Superintendent Ellen Agostenelli received a call from a parent of a 6th grader complaining about a book his daughter had picked up from the school’s summer reading display. 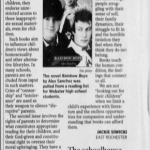 The complainant thought the book was inappropriate for his middle-school-aged daughter—it was from the high school display section—and thought it should be removed from the district’s summer reading list because of sexually explicit content. 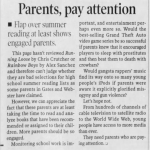 Agostenelli agreed with the parent’s concerns and removed the book from the summer reading list. However, Agostenelli failed to follow the guidelines laid out by the school for situations such as these. 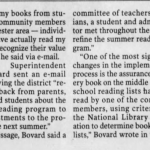 The book removal gets reported in the Democrat and Chronicle by journalist Bennett Loudon. 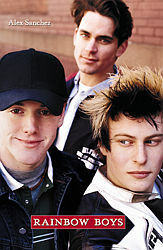 Bennett Louden, reporter for the D&C. 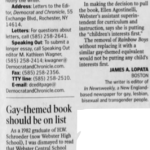 Then, following an influx of criticism and support for the decision submitted to both Webster Schools and the Democrat and Chronicle, a meeting was held at Webster District Offices to discuss the challenge to Rainbow Boys. 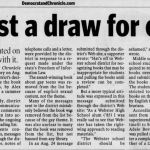 At the meeting, Webster librarian Trish Warren argued that District Policy 5292 regarding challenges to library material was not followed and thus, the book must be re-challenged. 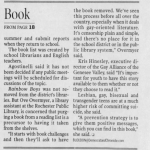 Whether a challenge was never reissued, or was reissued and then rejected, is unclear, but the book was placed back on the display following the meeting. 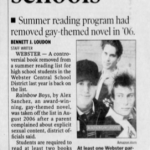 Rainbow Boys remained there until it was removed within recent years by Webster librarians to be replaced with more current representations of LGBT life.